I know, I keep posting things you can't read! But it says, "If a bathroom in your house has seen better days, but a major renovation is out of the question right now, consider a mini-makeover. There are many little things you can do that will spruce up your space without spending a lot of your time or money." And their #2 tip? "Swap an oudated or builder-grade light fixture with something more modern.... A chandelier is a fun option, which can add a little drama to a small space." They say to avoid fluorescent lighting because it can cast an unflattering light, but that is actually not true of today's fluorescents. Most of today's lamps have a very high color rendering index with wonderful color temperatures, and of course they are very energy smart! So if you want to conserve energy, do not be afraid to use fluorescents. However, I will admit that I generally prefer to use incandescent or halogen lamps and then dim them. 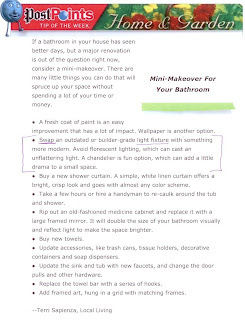 My bathroom dimmer is the one I could NOT live without! I start off my day with it super dim so as not to jolt my system, and then gradually make it brighter as needed. And remember that dimming will save energy AND extend the life of your light bulbs, so why NOT dim every light in your house?! On another note, we were very sad to hear yesterday that Washington Spaces magazine is folding. We LOVED that magazine and looked forward to every issue. So it's a very sad sign of these rotten economic times to see it close. Don't forget our Facebook contest! Become a fan and you'll be automatically entered to win a $100 gift certificate when we reach 300 fans. Tell your friends!